I can – very unscientifically – draw a few conclusions from the above…but it’s more fun if your comments lead the way. They all look pretty insincere when you put them all together like that. I still like “Employer of Choice”. It lends attractiveness to the company without implying the empty promise that your new boss will treat you with respect. I’d feel the same way – if companies who used it actually had to “re-register” every year. You’re right that it implies a larger construct than simply one that is associated with you and your boss. Do your employees love to work for your company? 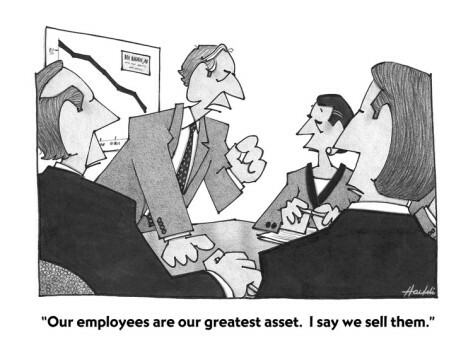 Are employees’ full potential being realized? Are employees planning on staying with your company? Are communications open, honest, positive and future-focused? Are people proactive and see, own, and act on problems quickly and efficiently? Are truth telling and risk taking encouraged and rewarded? Is there a high level of cooperation and collaboration? Are people respectful and seek to bring out the best in each other? Is there a healthy work-life balance? Do employees have energy and passion? Do employees trust and respect their managers and feel valued and supported? Are your leaders trusted and respected? Are employees regularly rewarded and recognized for good performance? Are there opportunities for growth and development? Are employees encouraged to contribute and make a difference? Are employees proud to work for your organization? Would your employees recommend your company to their friends as a good place to work? Use your word wisely. It is important to communicate with employees with honesty openness, and respect. Communications should focus on what is possible. Be accountable. Employers should act proactively and be committed to truth telling, focusing on the question behind the question rather than offering excuses or explanations. Focus. By focusing on independent goals, employers can extract the greatest value from the efforts of employees. Mine the gold. Employees and managers should strive to bring out the best in their employees, and be committed to collaboration and cooperation. Strive for balance. Employees will be vital and energetic at work as a result of a balanced life. Employers should therefore give their employees the opportunity to refresh and renew. Lighten up. Perhaps the most difficult of the six principles, employees should not take themselves so seriously. Employers and their employees should seek to bring laughter and joy to the workplace and look for opportunities to make other people’s day. Sure is quite a bit of work; I’ve seen too many companies simply take short cuts then anointing themselves EOCs. Totally agree with you that EOC should be more of a certification, like ISO 9000. Company’s should have go through an audit every year or two to be certified. Only then would it actually mean something. This is fantastic – love the cartoon!